Iron and Wine: October 15, 2003 Knitting Factory – Flac Download + Tour News! This week it was announced that Iron and Wine would perform a pair of intimate concerts at NYC’s Abrons Arts Center on May 17 and 18, as part of a tour of small venues with setlists chosen by the fans. Tickets for the Abrons shows go on sale today (Fri 2/20) at Noon EST NOW. Perhaps the last time that Sam Beam performed at a venue in NYC of this modest size was his first couple of trips to New York, when he played the Knitting Factory. The second such appearance is the concert offered for download here. That night the Knit was a completely packed house, and Iron and Wine delivered a full length concert of one-hundred minutes of material. The setlist included five songs from his yet-to-be-released second album Our Endless Numbered Days, along with one very memorable Flaming Lips cover — “Waitin’ for a Superman” which Iron and Wine will officially release for the first time on May 19, 2009 on the new compilation Around the Well. This concert was recorded by long time local taper xcxre9, who provided the never-circulated master DAT for extraction and production to be posted on nyctaper. The recording suffered from a major flaw that was adjusted in post-production. The low volume of the quiet music was respected by the crowd during the songs, but the volume of cheering was overwhelming during the breaks in between numbers. In post, the crowd was reduced to an unheard-of 10% of its original volume. Listeners can hear some artifacts of this process, but the overall listening enjoyment of this recording as a whole has been greatly increased. Enjoy! This concert is being offered in flac format only in respect for the original taper. 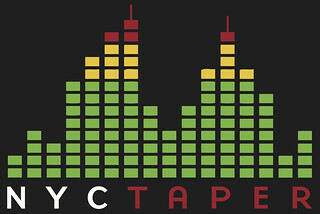 If you email nyctaper for access to this recording, we expect that you will PLEASE SUPPORT Iron and Wine, visit their website, visit their MySpace page, and purchase their official releases and merch from the store at their website [HERE]. 2 Responses to Iron and Wine: October 15, 2003 Knitting Factory – Flac Download + Tour News! Tickets are on sale NOW, and its 10:30am. I just got tix for both days, so go get ’em! This is an awesome recording of an awesome gig. Thanks!